How to develop a meditation practice - Part 2 - Well- being Tips| Nutritionize! In part 1 we explored the benefits of meditation and shared a bit about my personal experience with art, science, and discipline of meditation. This week we will talk about “how” to integrate meditation into our lives. First off, let’s start with a clean slate. Meaning clear out preconceptions of what it means to meditate – sitting crossed legged, having no thoughts, spending hours a day in silence. Although these can be a part of someone’s meditation practice it is not the end all rule of thumb. To meditate is to have focused attention. There are many paths to obtaining and exercising focused attention ranging from chanting, moving, gazing, visualization, breathing and more. For the purpose of this article we will talk about breath focused meditation but keep in mind that is only one of many methods. To meditate is to be aware of “non focus” and bring back to “focus”. This is probably the most important and often overlooked part of meditation. Asking one to sit and focus on the breath and nothing else is asking for failure. Our over stimulated brains are constantly jumping from one thought to another from the past to future, this activity often goes unnoticed because we’re busy engaging in the task at hand however this activity is brought to the forefront when we are no longer distracted and deliberately trying to focus. Imagine going on a bike ride or attempting to find your 1 rep max deadlift. To complete the ride you may have to shift gears a few times depending on the terrain and strengthen your climbing muscles or you may have to start off with lighter weight and slowly add on more or may take some weight off. These might not be the best analogies but my point is you have to course correct along the way. Same goes for meditation. The point is to notice when the mind has wondered and bring it back to the point of focus in this case the breath. As the mindful muscle gets stronger the length of time it takes to notice the mind has wondered decreases from minutes to seconds. And the mind gets stronger. It’s like your playing a game with the monkeys, over time they get tired and your mind gets stronger. Is it going to require hours a day sitting in crossed legged position sitting under a banyan tree… fortunately no! As with most things in life it’s about quality not quantity. Having a consistent daily practice for 10 minutes is far better than having an hour long practice once ever couple weeks. Consistency is key. Just like you’d brush your teeth every morning you’d brush your brain as well. I hope now you’re not intimidated to give meditation a shot and maybe even eager to do so. Sit either on the floor on a cushion or on a chair. Roll your shoulders back and make sure the spine is straight and chin slightly down. 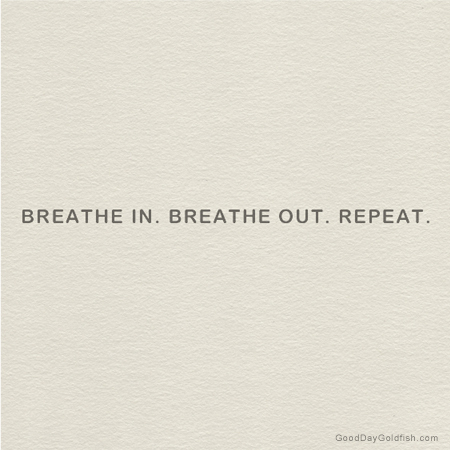 Take a deep breath through the mouth and big exhale out the mouth (repeat 2 more times). Now close the mouth and breathe through the nose only. Notice the breath at the nostrils. Notice any thoughts in the mind. Notice any pains in the body. Don’t evaluate these thoughts or pains just notice. Then return back to the breath. As you breathe in, say “inhale” in your mind. As you breathe out say “exhale” in your mind. If you find yourself day dreaming simply return your focus back to the breath and continue saying “inhale” and “exhale” in your mind. To help guide you in this practice use this Breath Focused Meditation recording. Simply get comfortable and press play. - How long will you meditate for? Minimum of 10 minutes is a good starting point and then adding 5 minutes every week until you hit 60 min. Meditation may sound a bit foreign but the art of self- study is primal in nature. As always don’t take my word for it, give it a try and report back.